If you've struggled with the question of how to pack a bow or hack saw in to the backcountry, the Gerber Gator III Saw gives you a simple, compact answer. 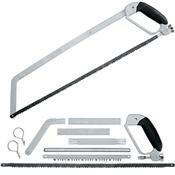 This sheathed field saw comes with a 10-inch bone saw, a 10-inch wood saw, and a 20-inch, ultra-sharp collapsible chain saw. The entire saw fits into a case that's less than 10 inches long and four inches wide, so it's easy to pack for hunting trips, campsite fire-building, or trail maintenance work. At a mere two pounds, it's light enough to carry in a backpack on short trips. The Gator Saw has a rubber-coated handle for a solid grip. Gerber designed a special attachment system to keep the wing nut from flying off when you really get into saw mode.